Climate Skeptic Article Inflation: Wattsupwiththat? Whenever a newspaper reports on an article that confirms man’s role in global warming, a number of outraged citizens usually proclaim on the newspaper’s blog site that the article is wrong. When asked for their source, they often list Wattsupwiththat, Anthony Watt’s blog site. One recent newspaper article reported on the BEST study, done by a team of climate skeptics funded by Koch industries and led by Dr. Richard Muller, a noted climate skeptic. Dr. Muller’s team analyzed 1.6 billion temperature records in an effort to prove climate scientists wrong. But they didn’t, and Dr. Muller acknowledged it. He reported that global temperatures were probably higher and man’s role was likely greater even than that reported by climate scientists. He also found that the temperature station data, often criticized by skeptics, was accurate – and that the only credible explanation for global warming is the increasing atmospheric CO2 from man’s activities. The summary of the paper describing the work is now available. However, that isn’t the whole story. The paper was a conference contribution based on a graduation thesis which was submitted to the EGU session, “Climate, Hydrology and Water Infrastructure”. The abstracts are not peer-reviewed and most of Watts’ data was taken from the slides which are also not peer-reviewed. The paper was presented in the wrong session where it was not likely to be heard by experts in the field. There actually was a session on “Homogenization of Data”. An EGU member in attendance noted the paper had errors, and commented, :” It would have been better if this abstract was sent to the Homogenisation Session at EGU. This would have fit much better to the topic and would have allowed for a more objective appraisal of this work. Had I been EGU convener of the Homogenization Session, I would probably have accepted the abstract, but given it a poster because the errors signal inexperience with the topic and I would have talked to them at the poster.” That hardly refutes Dr. Muller’s work. Another newspaper aticle reported that a link had been shown between extreme temperatures and global warming. In the past, climate scientists could only say that climate change was increasing the probability of severe weather, heat waves, and droughts. However, a recent paper by James Hansen et. al. established that the probability of extremely hot temperatures, worldwide, is now 10 times as likely as in 1980. 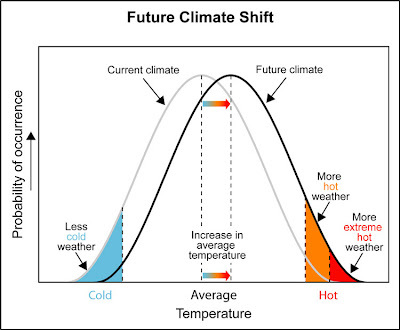 Not only did the paper establish a definite link between climate change and extreme temperatures, but the paper was a straightforward statistical analysis that did not rely on theory or climate models. It would seem that that would be difficult to assail. As you can see, the two graphs are quite different. Dr. Mass*, who is a Professor of Atmospheric Sciences at the University of Washington , does not accept the conclusions of most other climate scientists, and prefers to assign most of global warming to natural variability, a view that Hansen disproved in his paper. Dr. Mass is known for making controversial statements, and though he volunteered his time at for several years as a TV weatherman, he was released for making controversial statements. Mr. Mass apparently rejected Hansen’s paper, as he does not comment on the correct distribution – or that the paper mentions extremely cold temperatures. Climate Skeptics often argue that an extremely cold weather event disproves global warming. 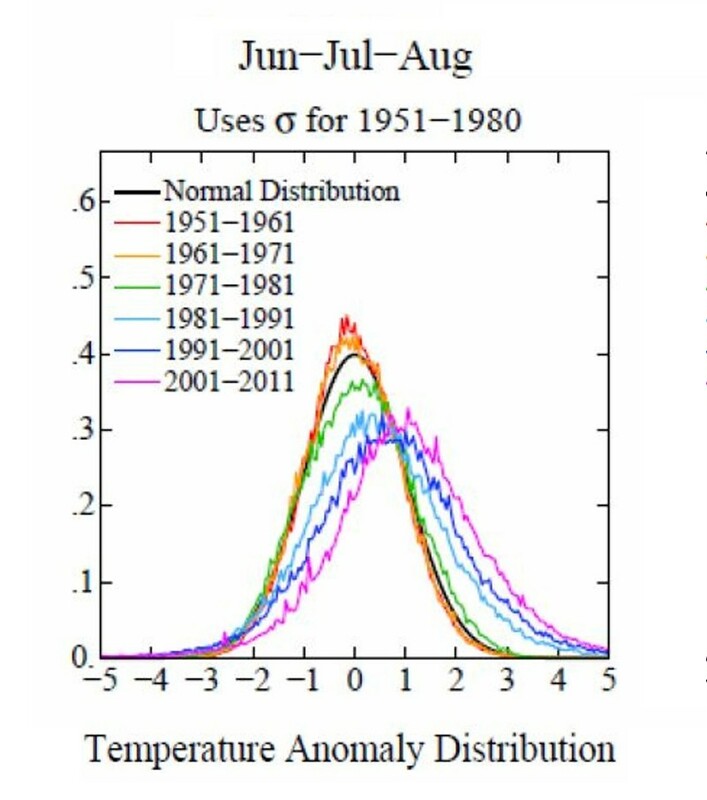 However, a similar distribution for the winter months (see paper) shows a significant probability of extremely cold weather events, even though global warming is occurring – meaning the skeptics argument is baseless. So, Mr. Watts claims a student paper with errors, presented in the wrong session, and is in no way peer reviewed, invalidates two years of work done by a team of climate scientists. You would think that one could not inflate a paper more than that, but actually it can be done. And, Mr. Watts achieved that by promoting Dr. Mass’ article. * Note on 09/05/2012. The original version of this article did not give the full credentials of Dr. Mass and the article has been updated with the correct information. Please see the comments for a discussion of this issue. This entry was posted on Tuesday, September 4th, 2012 at 11:40 am	and is filed under Climate Change. You can follow any responses to this entry through the RSS 2.0 feed. You can leave a response, or trackback from your own site. There is so much wrong with this article it is hard to know where to start. First, I have NEVER been a TV weatherman and was not released from a TV gig due to controversial statements. I am a professor of atmospheric sciences at the university of washington, have published roughly 100 articles in the refereed literature, with at least 12 on climate topics. I have co-authored papers with Steve Schneider and Carl Sagan. Thanks. It was on a weather blog and it did not seem worhty of a real scientist. Are you denying that was your blog? I’ll check out your claims and correct the article if needed. It seems more worthy of a discredited TV weatherman, than an atmospheric scientist. How many scientists start their article with a cartoon lampooning fellow scientists? If you have found an error in Dr. Hansen’s work, why don’t you submit it to a referreed journal? Here is the link where I got my information, a letter releasing you from your responsibilities at KUOW. http://publicola.com/2011/05/20/kuow-host-explains-decision-to-cut-cliff-mass/. It said : “As Morning Fizz reported, KUOW decided to stop broadcasting longtime KUOW Weekday weatherman Cliff Mass. As Mass, a UW meteorologist, explained on his blog, KUOW didn’t like that he was voicing his (unflattering) opinions about UW.” The letter goes on to say some nice things., such a the fact that Dr. Mass volunteered his time to do the broadcasts. I’ll correct my article about your credentials. This brings up another important question for Dr. Mass. Do you receive any financial support or perks that can be traced to fossil fuel companies or their lobbyists? I know, like Hansen, I’m probably just one of those skeptics that “holds onto wacky/unscientific theories,” but did it ever occur to Dr. Mass to ponder what could cause such blocking highs and major circulation changes over the heart of nation, and that maybe, just maybe now, it’s in fact global warming? Good Point. Recent research by Dr. Jennifer Francis has shown that the decline in Arctic ice has affected the jet stream, making such things more probable and more persistent.